Honeypot is a fairly new technology but has become a part of the Defense-in-Depth strategy of security-focused organizations. Still many organizations are not very sure about its potential in terms of returns to the production activities and business processes. The focus of this paper is to help students, researchers and professionals with understanding of production Honeypots in order to make them aware of the basic technology and its benefits in the arena of Information Security. In this context the paper gives a comprehensive overview of Production Honeypots. We all have requirements of quality - though of varying degree, not only in products and services linked with our day-to-day activities but also in our professions. The process of managing quality has undergone tremendous changes from the initial concept of Quality Control of the 1960 through ;Quality Assurance of the 1970 to the all-encompassing Quality Management System in 2000 and beyond. Over a period of time ISO 9000 series of standards and models like SW CMM, CMMI, PCMM have evolved further from the era of Quality Control to Quality Management. In fact, it is absolutely correct to state that a good, sincere, effectively implemented Quality Management is nothing but GOOD MANAGEMENT, coupled with complete involvement of employees, specially, EMPOWERED employees. This paper discusses how top management can quality its top priority by involving empowered employee. Transmission control protocol has become the dominant communication protocol suite, since 90% of Internet traffic is carried by TCP. This reliable transport protocol was tuned to work with wired networks with stationery hosts, where packet loss is treated as congestion in the network. With recent development in mobile computing and wireless network, which is characterized by limited bandwidth, high latencies, high bit-error rates and temporary disconnections traditional TCP protocol fails to give optimized performance. 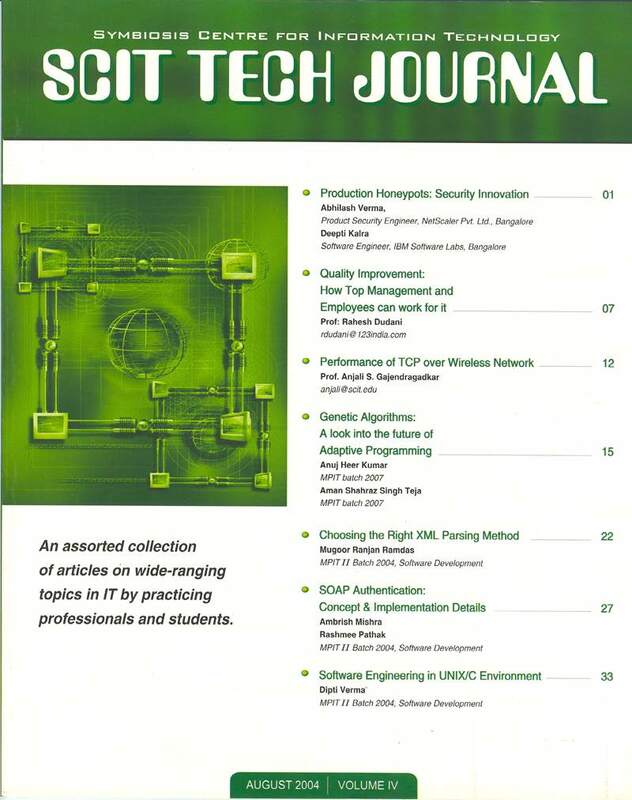 This paper tries to highlight the weakness in TCP protocol over wireless network and also discusses some of the modifications made to TCP protocol to obtain better performance over wireless network. Genetic algorithms is a branch of programming which has been overlooked so far. It has been purely of academic interest until now. But recently scientists have started realizing the vast capabilities of this wonderful tool. It is the closest thing we have to a system that mimics nature. But so far progress has been limited due to confusion in the minds of the common man about what genetic algorithms signify. This paper takes a look into it and tries to answer some of those questions. XML is a new data modeling standard that has been specifically designed to allow data to flow between systems. It is particularly beneficial in distributed environments and across platforms. XML parser is required to retrieve information from an XML file. Various performance issues needs to be answered like the memory resources required and scalability to select the optimum parser and the parsing method. The most important decision you'll make at the start of an XML project is the application programming interface (API) you'll use. Many APIs are implemented by multiple vendors, so if the specific parser gives you trouble you can swap in an alternative, often without even recompiling your code. However, if you choose the wrong API, changing to a different one may well involve redesigning and rebuilding the entire application from scratch. Soap (Simple Object Access Protocol) is XML based lightweight protocol to invoke a remote procedure call (RPC) on another machine. Executing a remote procedure call simply means sending a request to some other machine, executing a program on that other machine, and receiving the program output on your original home machine. One of Soap primary goals is to rely entirely upon existing technology in order to accomplish this. Therefore, it uses a flexible XML specification, which can be sent over HTTP or SMTP. The scope of our research is to concentrate on the authentication issues using SOAP, which forms the backbone of web-services security. Since SOAP is being used to provide web services there is need to provide for an authentication mechanism separately, so that only users with valid credentials can access the web services. We have tried to understand the mechanism by which we authenticate the user using the basic HTTP authorization as the underlying mechanism. The mechanism is able to authenticate a user based on the web service and method he is trying to access. Software engineering tools are used to achieve better quality of software in terms of reusability, maintainability, readability & modularity. These are also expected to enhance productivity. Various tools are famous in the Windows environment. But many elegant tools are available in the Unix domain. Although these are of primitive nature they are the foundation for developing more real-time tools. This paper explores such tools in Unix domain and talks about various tools available for requirement, design and coding phase.